In Benghazi, U.S. Intelligence Wasn't Focused On 'Homegrown Militants' New York Times correspondent David Kirkpatrick spent months on the ground in Benghazi, Libya, trying to get to the bottom of the deadly Sept. 11, 2012 attack on the U.S. Consulate. 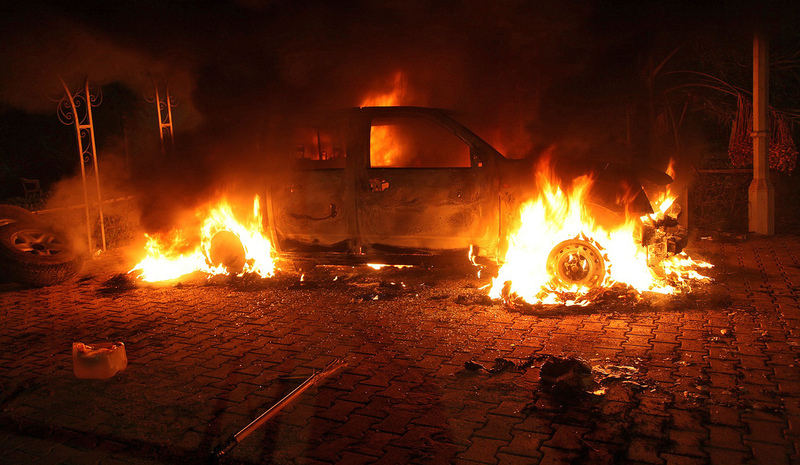 A vehicle inside the U.S. Consulate compound in Benghazi is engulfed in flames after an attack on Sept. 11, 2012. "There is no evidence whatsoever that al-Qaida or any group linked to al-Qaida played a role in organizing or leading the attack," says New York Times correspondent David Kirkpatrick. On Sept. 11, 2012, an attack on the U.S. diplomatic mission in Benghazi, Libya, killed U.S. Ambassador Chris Stevens and three other Americans. Who led this attack and why have been the subject of much controversy in Washington. Republicans have charged that the Obama administration and Hillary Clinton's State Department were at fault for not stopping what the Republicans claim was a carefully planned attack by international terrorists, including al-Qaida. New York Times Middle East correspondent David Kirkpatrick spent months on the ground in Benghazi trying to get to the bottom of exactly what happened there. His article "A Deadly Mix in Benghazi" was published in the Times in December 2013. He spoke with more than 100 people and tried to reconstruct the events of that day. And he has identified Ahmed Abu Khattala, a militant who appears to have been a leader of the attack. Kirkpatrick, who is also the Cairo bureau chief for the Times, joins Fresh Air's Dave Davies to talk about Benghazi and about developments in Egypt, where the military regime that took power last summer has waged an oppressive crackdown on political opponents. Part of what was so astounding about the debate and the variety of the theories is that it was an event that took place more or less in the open. ... This was an event that drew a crowd, a crowd that grew all night, where there were dozens or hundreds of witnesses to the main events. The killing of Ambassador Stevens had become a major issue in American politics and also just a murder mystery. There was an astonishing number and variety of theories about how and why he had died on the night of Sept. 11, 2012, at the American diplomatic mission in Benghazi. Part of what was so astounding about the debate and the variety of the theories is that it was an event that took place more or less in the open. It wasn't like someone surreptitiously stuck a car bomb under his car, or quietly assassinated him with a sniper's bullet; this was an event that drew a crowd, a crowd that grew all night, where there were dozens or hundreds of witnesses to the main events. When I visited Benghazi in the immediate aftermath, I got the feeling that a lot of people in Benghazi actually had a pretty good idea of what went down. So I felt, and my editors felt, like — given that this was a pressing question of political consequence and public interest in the United States — the least we could do is spend some time in Benghazi asking the people who actually live there what happened. In retrospect, it is a little bit heartbreaking to see how it all played out. Every Islamist group of any stripe, every fighter against [former Prime Minister Muammar] Gaddafi in eastern Libya owes the U.S. and NATO a great debt. NATO intervention saved the city of Benghazi when Col. Gaddafi's troops were about to crush it. NATO air power helped the rebels oust Col. Gaddafi. When Ambassador Stevens would walk through the city of Benghazi, he was beloved. They called him Chris. He had been the first American envoy there after Benghazi declared itself free of Col. Gaddafi — at a time when even showing up was a risk on his part. When Ambassador Stevens would walk through the city of Benghazi, he was beloved. They called him Chris. He had been the first American envoy there after Benghazi declared itself free of Col. Gaddafi — at a time when even showing up was a risk on his part. It was not an easy thing to do to glide into the harbor on a Greek fishing boat and begin walking around the city, wondering what was going to happen next. In his life, I am certain that he had a very strong sense of the deep gratitude among many people in Benghazi and in eastern Libya. Khattala is a kind of a small fry, really. He is for sure, by anybody's measure, a militant. I've met him a few times and from his own telling, he takes a very dim view of the West. He sees Islam and Christianity as locked in an inevitable and deadly conflict. His understanding of Islam is idiosyncratic to say the least, and many of his fellow Islamists, even militants — even the ones who would call themselves jihadis — consider him mentally unstable. He's erratic. Under Col. Gaddafi he had been jailed several times. It's worth noting that if there was an Islamist of real leadership potential — somebody Col. Gaddafi saw as a real threat — he locked him up and he threw away the key. You meet guys there who have been in jail for 20 years and generally they're bright, and they're effective, and that's why they were jailed. Ahmed Abu Khattala wasn't that guy. [Khattala] was one of the usual suspects. He was rounded up and imprisoned and released four times for a total of 16 years preceding the uprising in 2011. And of course, when it was time for an uprising, he grabbed weapons along with everybody else and there were a lot of young people running around Benghazi looking for someone who had credentials — like years in prison, a long beard, and a militant ideology to try to lead them to the front. So he put together a small band of mostly young people and became a brigade leader. Well, the Republican statements for a long time ... described it very assertively as an "al-Qaida attack" or an "al-Qaida-led attack." I found no evidence of that and to be honest, neither [have] the American intelligence agencies or the FBI investigation, based on my reporting. Subsequently there have been some indications in a center report on intelligence that people present for the attack may have been affiliated with a variety of terrorist groups — like al-Qaida in the Islamic Maghreb or Ansar al-Sharia in Darna [Libya] or even al-Qaida in the Arabian Peninsula. That wouldn't surprise me at all if individuals were present in Benghazi who had those kinds of ties. It was that sort of port of call. If one of those individuals is present and there's an attack going on at the American mission, are they going to stay home? No. Of course they will join the attack. There is no evidence whatsoever that al-Qaida or any group linked to al-Qaida played a role in organizing or leading the attack. Looking back, it's clear that there was an intelligence failure, a failure to anticipate the attack. ... My reporting leads me to believe that the American intelligence efforts in Benghazi were pretty good at keeping a close watch on the people who had known ties to al-Qaida, the obvious al-Qaida militants. But they were very weak on studying the local and homegrown militants ... who turned out to pose a much greater threat to the mission and were really just a few kilometers away.